Located in Annapolis, Anne Arundel Medical Center (AAMC) serves over 1 million people and is the state's third busiest hospital. AAMC was founded in 1902 and includes many difference services: a hospital, a medical group, imaging services, and a substance abuse treatment center. It offers sub-speciality care in every area of surgery. Nationally, AAMC is recognized for its joint replacement center, emergency heart attack response, and cancer care. It also ranks second in Maryland for the number of births annually. AAMC has 415 licensed beds. Anne Arundel Medical Center has over 1,000 medical staff members, 3,900 employees, and 750 volunteers. In addition to the facilities main hospital campus in Annapolis, there are outpatient service locations in Bowie, Kent Island, Pasadena, Odenton, and Waugh Chapel. While there have certainly been many lawsuits, verdicts and settlements involving malpractice claims against AAMC over the years, this is a pretty good hospital. Anne Arundel Medical Centers awards include Top 25 of the Nation's Best Practices in Patient & Family Engagement, the HealthStream Award for Highest Community Perception of Quality, Becker Hospital's Review's Top 50 Greenest U.S. Hospitals, and Most Connected recognition by the U.S. News and World Report. For a comprehensive list of the awards, you can go here. Anne Arundel Medical Center is located in Annapolis, and accordingly, most cases against them are filed in Anne Arundel County. AAMC is typically defended by attorneys at Armstrong, Donohue, Ceppos, Vaughan & Rhoades, Chartered. This hospital has also been defended by Wharton, Levin, Ehrmantraut & Klein and Goodell DeVries, Leech & Dan. Below is a list of some past verdicts and settlements against Anne Arundel Medical Center. 2015, Maryland: $2,520,869 Verdict. An adult female goes to defendants with cauda equina syndrome. She is examined and discharged without any tests or consultations with an ER physician or neurosurgeon. As a result of the delay in diagnosis and treatment, she suffers sexual dysfunction, constipation related to neurogenic bowel, and numbness along with a permanently altered gait. The defendants deny any liability and claim that applied the proper standard of care. The jury returned a verdict for the plaintiff for $2,520,869 which was reduced to $1,200,869 due to Maryland's malpractice cap on non-economic damages. 2011, Maryland: $28,874.85 Verdict (against doctor). Plaintiff goes to the ER with severe abdominal pain, and he is diagnosed with acute appendicitis. An emergency laparoscopic appendectomy is scheduled, and his appendix is removed by defendant physician at defendant hospital. The pathology report after states the whole appendix was removed, and he is discharged. However, fifteen days later, he returns to AAMC with increased pain, and a CT shows that his appendix was not entirely removed by defendant physician. Another physician examines the plaintiff and notes that an appendix was still in the plaintiff. Defendant physician discharges the plaintiff a few days later without any surgical intervention. He continues to have pain and has several follow-ups at AAMC. A month after his second admission due to pain, a new CT is done. The defendant physician is told multiple times that the patient still has an appendix, but defendant physician discharges the man again. Four months later, the plaintiff is admitted to AAMC and an appendectomy is done by a different doctor due to the same CT that defendant physician had read. Plaintiff files a claim against defendant doctor and AAMC, and defendants deny liability and claim that the standard of care doesn't require them to suspect dual appendices. AAMC was not found to be liable, but the jury ordered the doctor to pay $28,874.85. 2003, Maryland: $6,400,000 Verdict. The defendant doctor allegedly performs a negligent emergency Caesarean section, as plaintiff alleges the proper amount of oxygen was not supplied to the child until 80 minutes after delivery. As a result, the infant suffers brain damage which leads to learning disabilities and retardation. The doctors and hospital deny liability, but a jury awards the plaintiff $1,400,000 in future medical expenses, $3,500,000 in future lost wages, and $1,500,000 for pain and suffering. 2002, Maryland: $60,000 Verdict. An adult female goes to defendant physician during an ectopic pregnancy. She alleges that the doctors did not obtain her informed consent to remove her fallopian tube. A jury awards her $60,000. 1996, Maryland: $2,818,612 Verdict. A 58-year-old female goes to defendant hospital and surgeon to have surgery for gallstones. During the surgery, it is alleged that the doctor negligently allows a cystic duct stone to enter her common bile duct which leads to a blockage causing a backup of bile into the woman’s liver. Following removal of her gallbladder, the woman experiences shoulder pain, abdominal pain, cold sweats, and a rapid heartbeat so she is given a heavy amount of narcotics. She dies not long after being discharged from the hospital. The defendants argue that shoulder pain is common after the procedure and that her death was not related to the surgery. This argument obviously failed. Below is a list of some cases recently filed against Anne Arundel Medical Center's Hospital, and a summary of the allegations when available. 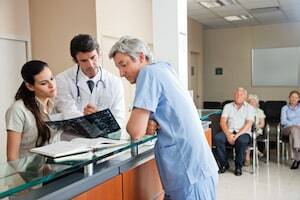 If you or someone you know was treated at Anne Arundel Medical Center and has been severely injured or killed as the result of negligence, you may be entitled to compensation. Contact our experienced medical malpractice lawyers at 800-553-8082. You can also go online for a free case consultation. No fee or expense of any kind unless we get money damages for you.